Local 213's annual summer picnic will be held on Saturday, August 19th from 12:00-4:00pm. Please call the hall to register. There are no calls at the hall today. Thank You & Have A Great Evening! CWB testing has been rescheduled for July 5th at 8:00am. There is 1 call for Hydroplumb at Irving Headquarters. They require 1 Plumber starting Monday June 26th at 7:30am. You must have all safety training up to date. Any local members interested in this call can contact the hall Friday morning between 8:00-10:00am. There is 1 call for Jacob's at the Refinery. They require 1 Pipefitter, 1 Apprentice Pipefitter and 2 F3/F4 welders to test on F3/F4 & F6/F5. Starting Monday June 26th at 7:30am. Duration is unknown and they are working 4x10's with possible overtime. You must have all safety training up to date, be able to climb and a D&A is required. This work is under long term maintenance and repair. Any local members interested in this call can contact the hall Thursday morning between 8:00-10:00am. The weld shop will be closed on Wednesday June 21st. Cwb testing has been rescheduled for July 5Th at 8:00am please call to register. There are no calls at the hall. CWB testing has been rescheduled for July 5th at 8:00 please call the hall to register. The weld shop will be closed on Friday June 16th due to a planned power outage. There will be CWB testing on June 22nd at 8:00 please call the hall to register. There will be CWB Testing on June 22nd at 8:00am please call the hall to register. Anyone interested in CWB Testing can contact the hall. Anyone interested in CWB Testing, can contact the hall. This is Local 213's Work Information for Thursday June 8th. It is with deep sadness we announce local member Harold Stevens passed away on Sunday June 4th. He is resting at Fundy Funeral Home, 230 Westmorland Road with visiting on Tuesday June 6th from 2:00-7:45pm. A funeral will be held in the Fundy Funeral Home Chapel on Wednesday June 7th at 11:00am. There is 1 call for Lorneville at Bayside Power. They require 1 Apprentice Pipefitter starting Wednesday June 7th at 7:30am. Duration is 1-2 days and they are working 10 hour days. You must have all safety training up to date. There is 1 call for Hydroplum at Irving Headquarters. They require 1 Plumber starting Monday June 3rd at 7;30am. Duration is unknown. You must have all safety training up to date. 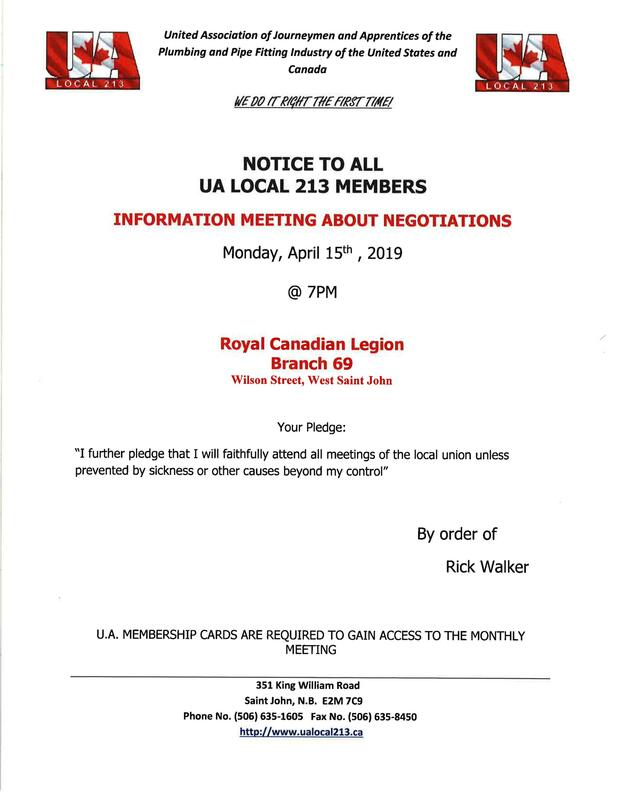 This is Local 213's Work Information for Wednesday May 31st. It is with deep sadness, we announce local member Howard Snodgrass passed away on Sunday May 28th. He is resting at Fitzpatrick's Funeral Home, 100 Waterloo Street, with visiting on Wednesday, May 31st from 2-4 and 6-8 pm. A funeral service will be held on Thursday, June 1st from Fitzpatrick's Funeral Home Chapel at 2:00pm. Interment will take place at St. Joseph's Cemetery. It is with deep sadness, we announce local member Howard Snodgrass passed away on Sunday May 28th. Funeral arrangements will be posted once we are notified. Any one interested in CWB Testing can contact the hall. There is 1 call is for Lorneville at Bayside Power. They require 3 Pipefitters with rigging experience for day shift starting Thursday May 25 at noon for orientation and starting work on Friday May 26th at 7:30am. Duration is less than 1 week and they are working a 4x10 schedule You must have all safety training up to date, must be clean shaven, must have rigging experience and this work is under the NMA. Our Out-of-Work list is Online!